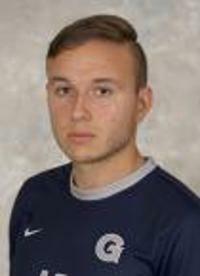 Zach Knudson is a Right Midfielder who graduated from Georgetown, where he was coached by Brian Wiese. This native of Oakland, NJ measures in at 5'9", 172 lbs. In 2017, he played in 18 games with 12 starts. During this season, he had 2 goals and 1 assist for a total of 5 points. In 2016, he played in 17 games with 13 starts. During this season, he had 1 goal and 2 assists for a total of 4 points.